I'd say White 10 in the previous diagram was a mistake, far too timid. White's wall gives perfect support to an influential approach like White 1 in this diagram. Black's speediness to play at 3 seems a mistake. A white approach at 1 has the potential to build opposing walls if Black doesn't pincer. Here a and b are miai. Alternatively I can play a distant hasami. Far hasami with possible continuation. In this case I still have two baseless white groups and my unattackable light center (if you attack from one side, the other side becomes vulnerable, if you attack from above, Black doesn't have a problem spreading along the top). It is too difficult for me to choose between these variations. And let White build both walls of her territory. And so on: it is not difficult to see how the Big Question Mark 26 position appeared. 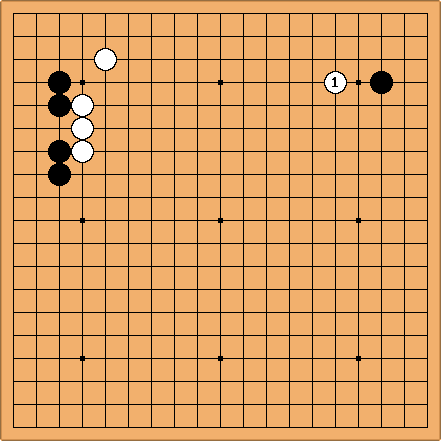 White 4 in the previous diagram shows inconsistent opening strategy. This original continuation doesn't seem to take into account the wall she has on the left side. HolIgor: Black 5 on your diagram is not going to happen. Black will play at 6. And I think White will not hurry to play at 5 in that case. Later it will become an important point. 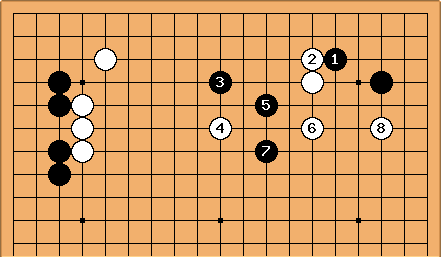 Takemiya's style of play is based on incredible reading ability and the skill to exchange center for territory on the sides or corners later in the game. I like to review his games to see that happening. Something I overheard on IGS: "Cho Chikun's style: this is mine and that is mine too, though you don't suspect it. Takemiya is nicer. He gives people some territory. In the beginning..."
Bill: before is not good. It strengthens White instead of making her heavy. How about ? If now , is a dual attack. is big.